An explosion at a U.S. military base near Tokyo set a warehouse on fire early Monday. The army says there are no injuries, but that U.S. firefighters immediately rushed to the scene to stop the flames from spreading to other buildings. Japanese firefighters say they will not try to out the blaze or make any efforts to fight it until they find out what is in the warehouse to avoid possibly making a dangerous situation worse. Residents near the base in Sagamihara, south of Tokyo, reported hearing about 10 minutes of continuous explosions and smelling gunpowder in the air. 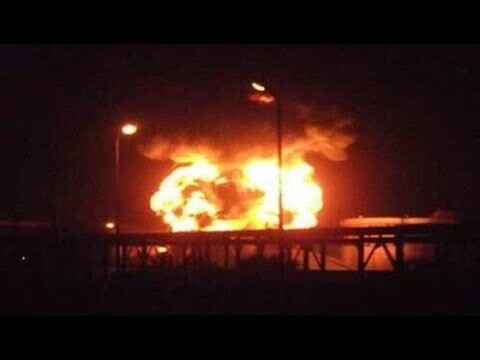 Multiple explosions and a large fire at a U.S. Army depot in Kanagawa Prefecture lit up the night sky early Monday. No injuries were reported. The blast happened after midnight at the Sagami General Depot in Sagamihara, a city about 40 kilometers southwest of Tokyo, said Navy Commander Bill Urban, a Pentagon press officer. Video on Japanese television, apparently shot from an elevated place outside the post, shows a fire in the distance and subsequent explosions shooting small fiery blasts into the sky. A woman told national broadcaster NHK that it sounded like fireworks. She told public broadcaster NHK that thunderous explosions were heard repeatedly for 10 to 15 minutes. “Orange sparks were rising quite high. I couldn’t see smoke but smelled something like gunpowder,” she told NHK. About 580 people work at the 200-hectare depot, NHK said. Aerial footage recorded by NHK about an hour after the fire began showed no flames rising outside the building, with a smaller orange blaze seen inside though its burnt roof. Japanese and American firefighters initially held off battling the fire to assess the contents of the building, and the blaze died out on its own about six hours after it started shortly before 1 a.m.
Daytime television footage showed part of the warehouse’s roof was burnt, and blackened metal. “We coordinated with U.S. fire units, and did not spray water as we waited for information related to what was inside,” an official at the Sagamihara fire bureau told AFP. “The Army appreciates the quick reaction and support of our partners from the Sagamihara City emergency services,” said an earlier statement from U.S. Army Japan. Urban said the depot did not store ammunition or radiological material. “The storage building is not designated as a hazardous material storage facility as some initial reports indicated,” he saidr. The cause of the explosion was being investigated by the American side, the Sagamihara fire official said. The municipal fire bureau had dispatched 13 fire engine and other vehicles to the site, the fire official said. Firefighters had surveyed the area around the warehouse and had not noticed any physical damage to nearby buildings or toxic fumes, he added. That's a little over the top considering the fire and explosion are confined to one building. Lady witness said it smelled like gun powder, i wonder how she knew how gun powder smells like. It's good no one got hurt and had the situation under control. Accidents happen, just be more careful. I saw some videos and read other news, it's a big disaster probably involving chemical stuff but some people here are minimizing! Have you never used fireworks? According to other sources tha Americans said to the Japanese firefighters that they can't use water, this means chemical stuff is involved. Why they keep such dangerous stuff in a populated area? I also read that witness "didn't see smoke" bit on NHK and thought it a bit strange when billowing clouds were so obvious from all the pictures.
" ...this means chemical stuff is involved. Why they keep such dangerous stuff in a populated area?" I'd venture a guess there are plenty of Japanese made chemicals being stored in or around Tokyo. But this is military stuff! At least this kind of crap should be kept far from populated areas, in my opinion. Some guys here sound like if they were from Tepco..."accidents happen, just be more careful, but everything is under control". Sure...this is why they can't use water. It's Tianjin again. All sorts of things are stored at Depot. Munitions, trucks, etc. It holds war supplies. Also things not being used by the base schools are also there. It is a neat place to explore. Modern gun powder and explosives do not smell like fireworks, but burning trash does. Black powder, used a century ago and before does smell like fireworks. I have fired a gun many thousands of times, and am familiar with the smell. The most absurd thing according to this article is that the US side doesn't know what is inside? Are they kidding? Indeed it sounds like Tianjin, horrible. Here you can find a video of it. It sounds like ammunition. I used to live right near there at Fuchinobe, they store a lot of stuff there. I hope it's all resolved safely. OK, seriously, "it sounds like Tianjin"?? That's a little over the top, isn't it?? Considering that no one has been reported hurt or killed and that the incident appears confined to one building, comparing this to Tianjin is a little ridiculous. Just because the Tianjin incident just happened doesn't mean these two incidents have any similarity. Other than an explosion/fire occurring in a populated area. I am not trying to minimise the incident. I am just saying that we should all be a little measured in our comments, particularly given that the known facts are limited at this point. It sounds like Tianjin because of the lack of trasparency and the fact chemical stuff is apparently involved since they can't use water! On a military base, any incident such as this is a significant matter to consider: from disgruntle staff to sabotage to even calculated warning of some sort. At a location of significance and in Japan, within a foreign military compound, where "control", safety and security, is imperative, this explosion is of Japanese national security issue. Putting "politics" aside, given the timing and the world scenario, nothing can be left out of speculation and investigative search. As usual Japanese politicians and activists will refer to this and water the investigation down by distracting from the real issues, pointing fingers and blaming everything and everyone else except themselves. The the media will dwell upon this with their own so called investigative reporting. We can only wait and see where this goes. Three cheers. The many U.S.-haters on JT will use any excuse to bash us any chance they get. Even when the size and scale of tow incidents are not even close. It sounds like Tianjin because of the lack of trasparency and the fact chemical stuff is apparently involved since they can't use water. Again, pure nonsense. Tianjin was a public area -- a major Japanese port in a densely populated area. This is one building on a restricted U.S. base. Get aggrip Alex. This statement is problematic for two reasons. First, lack of transparency. This incident happened in the middle of the night on the weekend and happened just 8 hours ago. That isn't lack of transparency, that is just called limited information given the circumstances. I guarantee you that everything will be fully transparent in the coming hours. Unlike Tianjin, where information is still murky and unclear. Second, not using water does not automatically mean the involvement of chemicals. Not using water only means that the nature of the materials involved is not fully known, so in the abundance of caution, water is not used in case there is some material involved that could react with water. And to be clear, munitions and chemicals are very different. The problem with the comparison you are using is that it evokes the image of a huge horrific disaster when this situation, while serious, is very much contained, does not apparently involve any injuries or loss of life, and has had limited impact apart from the building involved. Apples and oranges here. @Jerseyboy: It's so easy to call people American haters in every thread, uh? The US should take their responsabilty for their own disasters rather than find excuses for everything. Both if this was an accident or a terroristic attack, it shows how the safety wasn't handled properly. Guys debating it's location and how safe it is.... Get off your chair and visit it, no seriously! I passed this base on multiple occasions as it was my local suburb... Like 5 minutes bike ride. It's surrounded by a tall barbed wire fence with guards. Has lots of grasses clearance from the fence to the warehouses too. It's a perfectly safe distance from houses. Glad to know that nobody was hurt. @zones2surf: the Americans say they don't know what is inside and are waiting the experts(? ), do you think it's normal? Alex80: @zones2surf: the Americans say they don't know what is inside and are waiting the experts(? ), do you think it's normal? Isn't the "duty officer at the Sagahimara fire bureau" Japanese, not American? “We are coordinating with U.S. fire units and we are waiting for people who know exactly what is inside to tell us what’s inside,” a duty officer at the Sagahimara fire bureau told AFP. if this was an accident or a terroristic attack, it shows how the safety wasn't handled properly. 100% agreed. Hopefully it won't be explained using my least favourite meme: "mistakes were made". Hopefully the truth will out and those responsible will be named and held accountable. Wow. Like they don't know what is in there? Come on. I bet they know down to the number of dustballs. Footage shown on the morning news shows a large number of tanks both inside the building (seen through a hole in the roof) as well as some scattered around outside that were apparently tossed by the explosion. That's tanks as in the type used to hold propane gas or oxygen. Fire etc was limited to just one warehouse type building. J firefighters said they could not use water because the U.S. side had not/could not tell them what was in the building. It doesn't give the lady's age - and I was about to make the same remark - fireworks do/did smell like gunpowder. I'll mirror what other posters have already said: Get a grip. That's it. The building the fire and explosions occurred in burned to the ground, so that's something noteworthy, I suppose. But Tianjin? I don't think so. Not even remotely. There is a difference between the Americans saying they don't what is inside and the Japanese fire department saying that they are waiting to hear what is inside. Nothing in the article and in the Japanese fire department's statement indicates that the American's don't know what is inside. Just because the Japanese fire department did not have that information at the time they made their statement does not mean the Americans don't know. Keep in mind that, under the Status of Forces Agreement, primary responsibility for responding to incidents on base facilities rests with the U.S. military. We can debate whether that is OK or not another day. For now, it is just a fact. And the U.S. military does have resources on base to deal with these incidents. Of course, if they need support from the Japanese civilian resources, I believe there are mechanisms in place to facilitate that and they would provide the necessary information. In this case, I would venture to say that the first responders would be the base emergency services and they most certainly would be advised as to the contents of that depot/warehouse/facility. That is standard protocol. One thing I would note, which @Cortes has also alluded to. We all know that the military tends to protect operational details, for obvious reasons. However, when it comes to handling explosive materials, they tend to have strict procedures in place these days. Also, I would imagine that they have done risk assessments regarding the materials stored in this depot to ensure that, in the event of an incident, the incident can be confined within the space that is designed to house the materials. Obviously if I were a journalist and there was a press conference, I would ask this question of the military to confirm, but that would be standard protocol, I would assume. Heard these explosions in Machida early this morning. Sounded like thunder. Munitions are not stored there. Three explosions linked to a left-wing extremist group were reported in the vicinity of the base in April, according to the Wall Street Journal. @Alex80 "at least this kind of crap should be kept far from populated areas" At least this kind of crap should be kept somewhere in the USA. According to Wikipedia usage of term "depot" varies in English-speaking countries. Sagami General Depot (相模総合補給廠 Sagami Sōgō Hokyūshō?) is a United States Army post located in the city of Sagamihara, in Kanagawa Prefecture, Japan, about 40 km (25 mi) southwest of Tokyo. A logistics center, or depot, is a facility dedicated to logistical operations. A logistics center might be a warehouse, freight forwarder, or a repair depot. Let's take this a step further. At this time the origin of the explosions are not known. If it happens to be an act of sabotage, what does that say about the infamous secretly conceived US-JAPAN Security Pact? “We have not poured water (on the warehouse) because it could make the situation worse, depending on what is inside,” he said. A little tasteless barb at China here...........come on enough with the tacky reporting, we say plenty of this crap with the recent ferry fire, a LOT of not so subtle hints how it wasn't like the Korean ferry disaster, GROW UP!! It sounds like Tianjin because of the lack of trasparency and the fact chemical stuff is apparently involved since they can't use water! LOL Japanese companies store much more toxic chemicals both cuastic and radioactive that have done more damage to Japans people and enviroment and ever will, compared to what the US military bases in Japan store, by far. Has anyone from the Japanese government revealed what their "concerns" are? Official releases from, and what the media covers often differs from what is of real concern. This will definitely bring local outcry, especially negative ones. So the government as with the police are digging deep to find the answers. If they do find, it will be interesting to see and hear what they reveal and how they reveal it. The official position by both governments and that of the media will be of much concern for strategists in our neighboring countries. I saw it on the news seems like the storage for welding gas bottles, and the damage was only to one side of the building, so i assume that they were not all full. @wtfjapan"Japanese companies store much more toxic chemicals"
Japanese companies are located on japanese soil. They aren't foreign occupants. What about the Japanese that live close to the base? The fire may be emitting dangerous fumes. The USA is not disclosing what was in the building for what reason? I just hope the civilian authorities are taking air samples and if need be start an evacuation of the civilian population that is under possible threat. Japanese press is reporting the base has storage for petroleum products and ammunition. An American Commander said that the warehouse contains oxide cylinders. Then again like any Okinawa person believe the US military is constantly lying. The Japanese civilian authorities have a need to know exactly what was in that warehouse. this means chemical stuff is involved. Why they keep such dangerous stuff in a populated area?" they didn't use water with THE POSSIBILITY of certain chemicals being stored there. it was a wise decision (compared to what just happened in China recently). right. whenever they use munitions for exercise and stuff, they actually bring it from munitions depot. it was the Oxygen that made the big explosion. Time for a little basic Damage Control (DC) training I learned a long time ago in the Navy. Class D fires consist of combustible metals such as magnesium, potassium, titanium, and zirconium. You don't put them out using water since water and other common firefighting materials can excite metal fires and make them worse. The National Fire Protection Association recommends that metal fires be fought with dry powder extinguishing agents. So depending on what was stored there, the fire fighters made the right call. The base fire department was well aware of what was being stored there. Keep in mind, that the civilian fire fighters that are assigned to all the bases in Japan are Japanese MLC employees, who are well aware of the Japanese fire codes. There are only a few US citizen supervisors, but the fire fighters are all MLC. We mustn't get too "excited" about the word "chemical" in this case. The chemicals could be some very common ones like magnesium or sodium or some other industrial chemicals, that are found everywhere in Japan outside the bases. I am sure that there have been other warehouse fires in Japan, but in this case, the facility is owned by the US government, which makes it news worthy. MLC = Master Labor Contract, yes? For us not familiar, just wanted to confirm. @YuriOtani "What about the Japanese that live closer to the base?" I don't know what burned, but some of it went off like fireworks. Maybe it was fireworks? Have a look and see what you think. @wtfjapan"American military bases are legally American soil". You have no idea what "legally" means. There is nothing "legal" of American on Japanese mainland. Sooner or later you will be kicked out, just like Kyrgyzstan has recently did it. Alex 80AUG. 24, 2015 - 07:28AM JST Why they keep such dangerous stuff in a populated area? Because all substances are made of chemicals (even you and me. Even burning wood is a chemical reaction.) and there is no clear dividing line between safe and unsafe chemicals. For example, you would seem to be suggesting that a chemical fire that can be extinguished with water is a "safe" chemical, but go to the arid woodlands in the American Southwest where wild fires burn every summer and see how safe wood combustion chemical reactions are. The simple fact is that modern life requires chemicals, some of which are novel and not understood by non-chemists. In a country with dense populations like Japan, it's inevitable that these things must be stored in populated areas. What you need to make it work is transparency and information, at least with the fire-fighting crews. Let's wait for the evening news before we jump to conclusions about how much transparency there is going on here. Remember, only a couple years ago there was a magnesium fire in a civilian Japanese factory in roughly the same area. These things happen, and thankfully, in most countries people have procedures in place to keep civilian casualties to a minimum. yamashi I am use to the deception of the American military as a person from Okinawa and as an Officer in the Maritime Self Defense Force. I do not expect that the Americans will ever disclose the danger they have placed the Japanese civilian population. @Alex80... Apparently you don't know the procedures of firefighting a fire. Firefighters like to know whats in a building before they starting pouring water into it. Many metals (i.e. magnesium) and chemicals (many sulfates) react violently to water. Also not knowing what is in the building, they wouldn't know what hazards are draining out of the building with the water or if the electrical power had been secured. This is the job of the on scene commander who in this case was probably on the American fire fighting team. That is why it is very important to have MSDS forms filed! Japanese Fire Departments are in control of all base fire brigades. There might be a US Military Chief...I do not remember, but everything is done by the Japanese. That base is huge by the way. Best stuff I ever found there was all this chemistry glass and chemicals. Was pretty cool. Looked like a Frankenstein Lab. This is the job of the on scene commander who in this case was probably on the American fire fighting team. That is why it is very important to have MSDS forms filed! Probably the only American fire fighter on the scene was the fire chief on duty at the time. Also, depending on his language ability, there probably was a senior MLC (Japanese base employee) fire fighter who was actually doing the On scene work and coordinating with the off base response of the local fire department. The base fire departments and local Japanese fire departments do drills all the time, it's not like they are strangers to each other hampered by language, since the base fire fighters are all Japanese. I doubt if they had that much explosive (i.e. ammunition) stored in that warehouse. There is a long and tedious process the Dept. of Defense goes through in order to enable a building to house ammunition. That stuff is normally stored in different types of bunkers and facilities. And if it was, as long as the maximum allowances have been met to ensure that if a fire did happen it would not cause too much damage to the surrounding areas that is one of the reasons why the damage was confined to just the warehouse. @ yamashi: You don't know what "legally" means. Yes the US bases in Kyrgyzstan are gone, but it was because the government there told us that we were no longer needed, and due to the "legal treaty" we both signed we had to obey their wishes and move out. Japan has the right to ask us to move if the government really wanted us to, look at Okinawa for example. Yes the facilities on Japanese land are considered US territory, but we can't just pull up the land and take it back to the USA. When the government of Japan says that they want us out and have followed the provision set forth in the treaty between the two nations, all done "legally" we will leave. Don't let emotion cloud the facts. It looks like a maintenance storage building burned down. The most dangerous items stored were bottles of acetylene and oxygen, plus the usual cleaners and solvents, no weapon snot explosives. You don't have to believe the American side if you don't want to, but independent monitoring of the area shows nothing dangerous in the air, it was confined to one warehouse, nothing like China where half the base was blown up. Appears to be a fire in a warehouse that stored oxygen bottles etc. OXYGEN + FIRE = not good, watch the movie Backdraft. Doesn't mean there was ammunition or crazy checmicals etc stored there. I used to work near Sagamihara base, you can even run on part of the field for marathons etc. Sagami Depot is one of the 14 U.S. facilities planted in Kanagawa Prefecture, area-wise, the second largest (1,745 ha) after Okinawa that hosts U.S. bases. Not many prefectural residents are aware of the presence of those U.S. bases, though, because they are scattered widely across the prefecture unlike in Okinawa. But, certainly, their existence will be made aware of by such an accident as this. The neighboring Metropolitan Tokyo has 8 U.S. bases and, so together with Kanagawa Prefecture, there are 20 U.S. bases and facilities in the Metropolitan area. Is there any country in the world that hosts so many U.S. bases in and around its capital and claims it is a sovereign nation equal to the U.S. whereby it must help the U.S. fight its wars by even revising the constitution? I heard this from CHIBA! Intermittent 'booms' for about 10 - 15 mins! This sounds eerily similar to Tianjin, and i doubt it would've been an "accident" like what the media reports. Sounds like something, of military retaliation. es ONE warehouse destroyed with zero casualties is eerily similar to hundreds dead and an entire port destroyed. Put it into perspective, there's nothing similar here to compare the two. I'm just wondering how many bases the US has in Japan given that the WW II's been over for 70 years. Doesn't it have a large base on its own territory in the Pacific? It's called Hawaii. Hawaii is still far from Korea and China. These fire brigades have been working together for many years. CAMP ZAMA, Japan - More than 60 Japanese firefighters from Sagamihara City took part in an exercise hosted by U.S. Army Garrison Japan that was meant to foster a strong bilateral relationship between the two organizations and enhance their fire protection and response operations. The exercise, which was held Sept. 26 through 28 at nearby Sagami General Depot, provided both groups of firefighters the opportunity to exchange training methods and survey each other's respective operational capabilities in case of a fire. "After 'Operation Tomodachi' in the wake of the earthquake and tsunami that struck Japan in 2011, we gained a better understanding of our capabilities in regard to rescue operations within the local communities," said Yuji Kumamaru, deputy chief of the U.S. Army Garrison Japan Fire Department "We have now begun to establish closer and stronger communication with local firefighters." The exercise was held over the course of three days so that all of the firefighters from several nearby departments could attend. Represented at the exercise along with USAG-J were the Sagamihara City Fire Dept. 's Headquarter Incident Command Unit, the Sagamihara City Headquarter Fire Company, the Fuchinobe Fire Department's Fire Co., and the Sagamihara North Fire Co.
A briefing on the USG-J Fire Dept. was provided for exercise attendees, the content of which included information on the water supply on U.S. Army installations in Japan and their fire-suppression equipment. The briefing pointed out some of the differences in the equipment used by Army firefighters in comparison to their city counterparts, such as their fire trucks, water supply distribution systems and their hydrants. "The main purpose [of this exercise] is to understand each other more as neighbors, and to have an opportunity for face-to-face communication, which is important in the event of an emergency in this area," said Kumamaru. "Our goal is to build an efficient support system for each other." After the briefing, the group took a tour of the water supply station and fire hydrants at Sagami Depot. Later, a joint hose relay operation was conducted by the firefighters, during which they connected hoses from their fire trucks and extinguished a controlled blaze. The USAG-J Fire Dept. hosted a similar drill for their Zama City counterparts the previous week. The Garrison firefighters plan to visit local fire departments and receive similar briefings on their counterparts' equipment and operations in the near future, said Kumamaru.